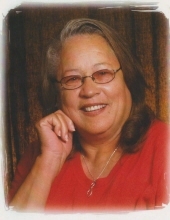 Mrs. Ernie Neal Britt of Pembroke, NC departed this life and entered her heavenly home on February 6, 2019. She was born on May 31, 1951 to the late Al Norton and Margaret Norton of St. Pauls, NC. Funeral services will be held 2:00 PM Sunday from the Smyrna Baptist Church with the Revs. Carl A. Pevia and Gerald Smith officiating. Interment will follow in Robeson Memorial Park. Mrs. Britt was preceded in death by her husband Mr. Danny M. Britt, a son; Carson Jr. Norton, a daughter; Fannie Bell Sampson, two sisters; Nita Rose and Jean Ray Norton and one brother; Ronald Ray Hunt. She is survived by three sons; Johnny and Donnie (Sandra) Norton and Chris Britt, all of Lumberton, two daughters; Margie (Bo Jack) Williamson of Richfield, NC and Linda (James Kelly) Sanderson of Pembroke, six brothers; James Hunt, Donald Hunt, Tommy Norton, Lacy Norton, Sammy Norton and Michael Norton, all of Lumberton, NC, six sisters; Annie Cummings of Rowland, NC, Willie Neal Williamson of Fayetteville, NC, Diana Norton, Almaner Norton, Susan McNeill, all of Lumberton, NC and Rose Norton of McDonald, NC, eight grandsons; Kenny, Johnny, Vinson, KAS, Jerry, Talmadge, William, James Kelly and Kelly Ray, three granddaughters; Jolanda, Erica and Margaret, five great grandson and seven great granddaughters. She has a few special sister in laws that were more like sisters; Shelby, Helen, Sara, JoAnn, Crystal and Judy, and a best friend Priscilla Ann Hunt. Several nieces and nephews that loved her very much, as well as a host of family and friends. Ernie was known by a few names; Grandma, Aunt Bo, and Pork Chop. She will be missed by all of her family and friends. Special thanks to Medi Hospice; Brandi Davis, Latisha Carter-Chavis, Brandi Cummings and Angela Locklear. Also, a special thanks to Dr. Charlene Locklear and TruCare Family Practice. In lieu of flowers, memorials may be made in honor of Ernie Neal Britt, c/o Smyrna Baptist Church, 8003 Hwy 211 East, Lumberton, NC 28358. The family will receive friends Saturday evening from 7-9 PM at the Smyrna Baptist Church, 8003 Hwy 211 East, Lumberton, NC 28358. To send flowers or a remembrance gift to the family of Ernie Neal Britt, please visit our Tribute Store. "Email Address" would like to share the life celebration of Ernie Neal Britt. Click on the "link" to go to share a favorite memory or leave a condolence message for the family.